A lovely old Kuba Mukyeem or Mukenga mask with a nice provenance. The Kuba Mukyeem or Mukenga mask of helmet-like form and large proportions a raffia attachment at the base, composed of a flat animal skin facial plane pierced through for attachment of the expressive beaded facial features and wearing an elaborate headdress composed of white, black beads and cowries. PROVENANCE: A colonial family acquired this at the end of the 1950’s from Paul Gilman, a retired Belgian collector living in Liège who had more than 70 Art objects mentioned in the Guy van Rijn Yale database of African art. This piece has a signed certificate of authenticity from a Belgian Gallery. The mask was created as a helmet used in initiation ceremonies; the ceremonies include those relating to the founding and creation of the Kuba kingdom as well as the ruling family, Mukyeem is known as figuring an elephant. Over twenty types of masks are used among the Kuba, with meanings and functions that vary from group to group. Kuba wooden helmet masks are probably the most commonly produced items, popular with the collectors. These striking masks are wonderfully decorated with geometrical surface designs in dazzling contrasts of colour, pattern, and texture. Hide, animal hair, fur, beads, cowrie shells, and feathers ornament the masks, and costumes of bark-cloth, raffia fibre fabric, and beaded elements complete the manifestation of nature spirits, intermediaries between the Supreme Being and the people. One widespread context for masking is initiation. Every several years a group of boys will be inducted into manhood through the initiation which transforms uncircumcised boys into initiated men who possess esoteric knowledge. 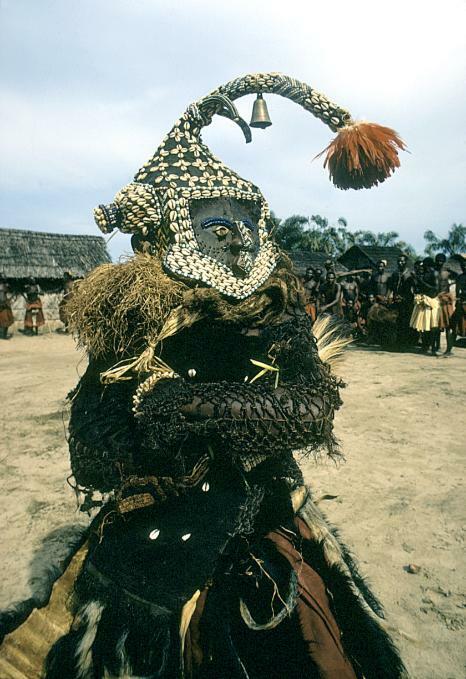 Funerals are a second important context for masks throughout the Kuba area. Three types of masks have been associated with dances that take place within the royal compound: the first, called Moshambwooy, represents Woot, the founder of the Bushoong, the culture hero. The second, known as Nady Amwaash (Ngaady A Mwash), personifies the wife/sister of Woot, a character said to have been introduced to the pageantry to give greater importance to the role of women. The third mask is called Bwoom. As a character, Bwoom has been interpreted variously as a prince (the king’s younger brother), a commoner, a pygmy, even a subversive element at the royal court. There are many differences among regional stylistic interpretations of the Bwoom mask, but the form’s most pronounced features invariably are its bulging forehead and broad nose. The drama is often reenacted in performances at public ceremonies, initiations, and funerals even of untitled men, though they are especially important at the funerals of titleholders. Bwoom is perhaps the oldest of the Kuba royal masquerade triumvirate. Oral traditions suggest that the genre may date back to about the middle of the eighteenth century. Other masks are collectively known as Isheene Mwalu.